James Pierson Beckwourth was an American mountain man, fur trader, and explorer. A mulatto born into slavery in Virginia, he was freed by his father and apprenticed to a blacksmith; later he moved to the American West. As a fur trapper, he lived with the Crow for years. 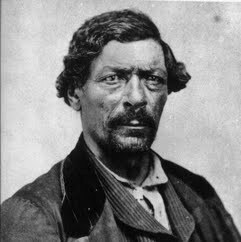 He is credited with the discovery of Beckwourth Pass through the Sierra Nevada Mountains between present-day Reno, Nevada and Portola, California during the California Gold Rush years, and improved the Beckwourth Trail, which thousands of settlers followed to central California. He narrated his life story to Thomas D. Bonner, an itinerant justice of the peace. The book was published in New York and London in 1856 as The Life and Adventures of James P. Beckwourth: Mountaineer, Scout and Pioneer, and Chief of the Crow Nation of Indians. A translation was published in France in 1860. Early historians of the Old West originally considered the book little more than campfire lore. It has since been reassessed as a valuable source of social history, especially for life among the Crow, although not all its details are reliable or accurate.